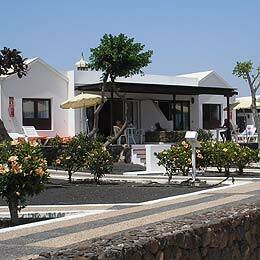 Address: Avenida Canarias, 6, Playa Blanca (Lanzarote), Islas Canarias. These cheerful bungalows are set around a fabulous outdoor pool and just metres away from the beautiful Flamingo beach as well as only a short walk to the commercial centre. Set in pretty gardens, you can enjoy the pleasant views from your Playa Limones Bungalow. Free WiFi is available in common areas. Enjoy your holiday in Lanzarote at your own pace. Cook up a feast in the well-equipped kitchens before dining in true, Canarian style on the outdoor terrace. Here, you can also enjoy an afternoon siesta on the hammocks provided. The cheerfully decorated bungalows have one bedroom and a lounge with sofa bed. The terrace is furnished with sun beds. There is a separate twin bedroom and a complete bathroom with shower and bathtub. Later, head to the bar for a delicious cocktail where you can also meet other guests and begin the evening’s entertainment. You can also complement your self-catered holiday with a tasty meal in the onsite Playa Limones Restaurant. The property does not accept American Express as a method of payment. Please note that children of 12 years and older are considered adults for breakfast and dinner rates.